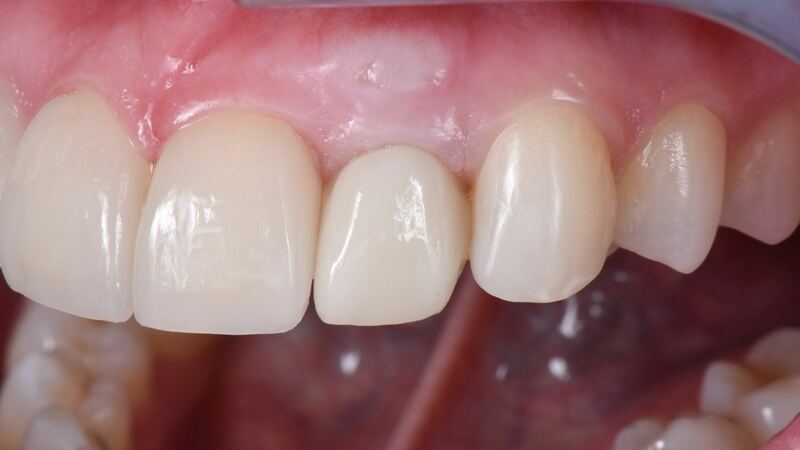 A 30-year-old female patient presented in the dental practice with an agenesic, upper lateral incisor #22 FDI (#10 US). 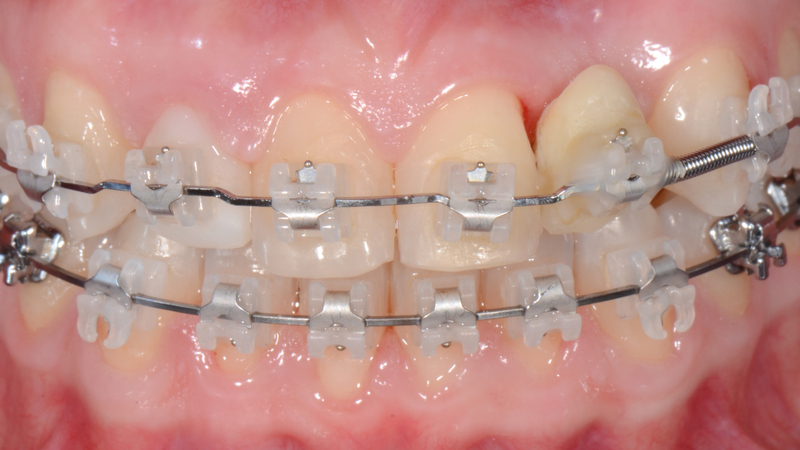 The patient had undergone space closure by means of a Maryland bridge fixed to the adjacent teeth. The edentulous space presented horizontal and vertical bone resorbtion. In addition, tooth #21 FDI (#9 US) had migrated mesially, bucally and apically due to occlusal force exerted on the Maryland bridge wing cemented on its palatal aspect and in contact with the antagonist teeth. The overal medical condition of the patient was good and there existed no concommittant oral pathologies. 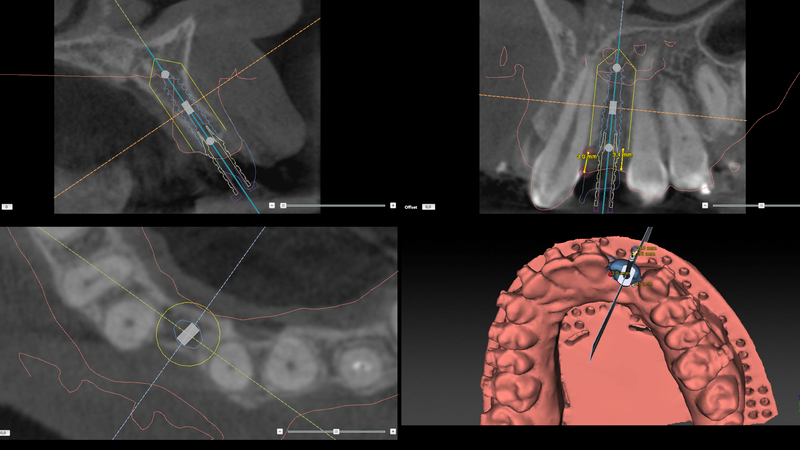 Orthodontic treatment to correct the occlusal and aesthetic discrepancies present in the anterior region and to create space for a dental implant in position #22 FDI (#10 US) was planned. 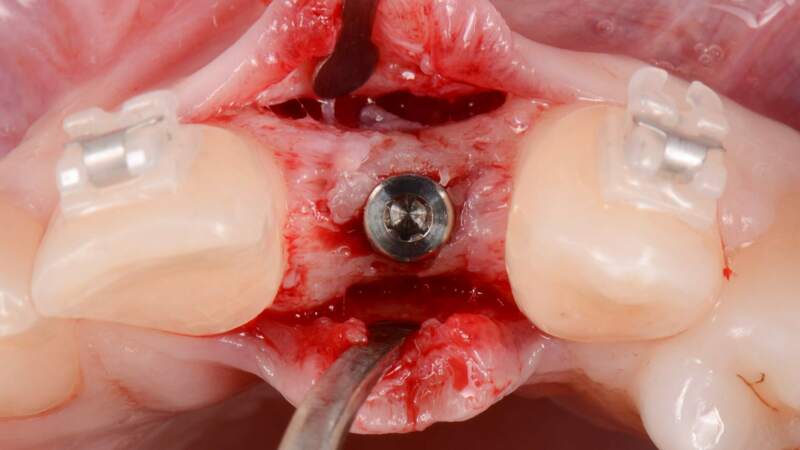 This was followed by the placement of an implant simultaneous to a soft tissue augmentation by the means of a subepithelial connectice tissue graft. 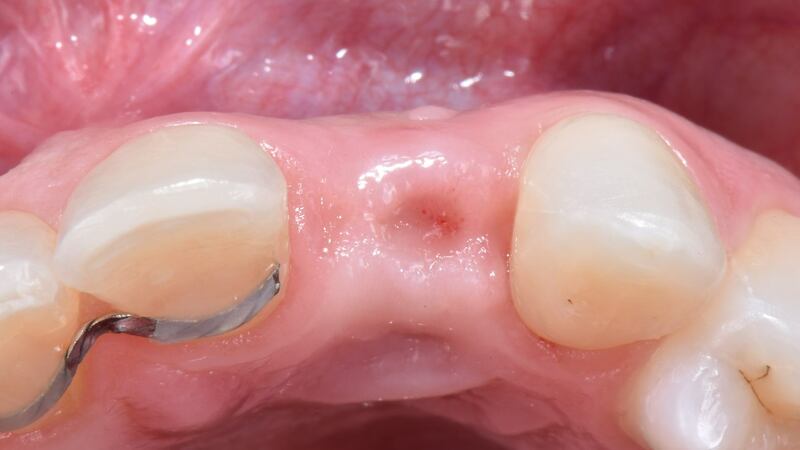 A cement-retained implant crown on a zirconia abutment was planned. 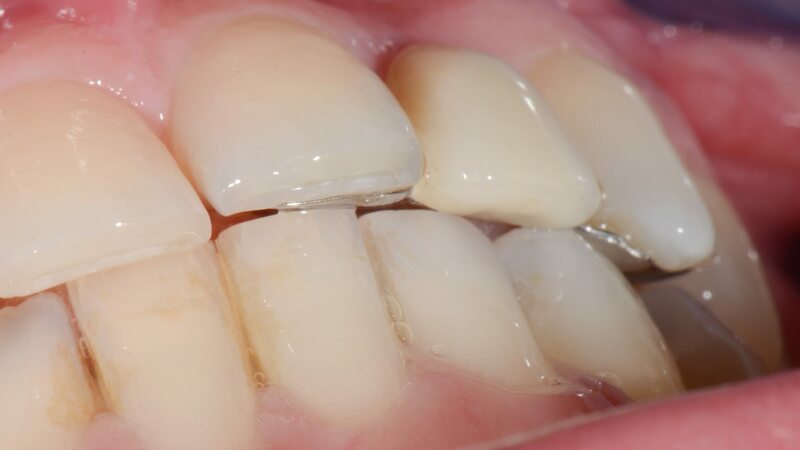 In addition, to harmonize the esthetic region, lithium disilicate veneers were planned in all four upper central incisors. Initial intraoral frontal view. Note the malposition of tooth #21 FDI (9 US) apically and distally. Initial intraoral frontal view. 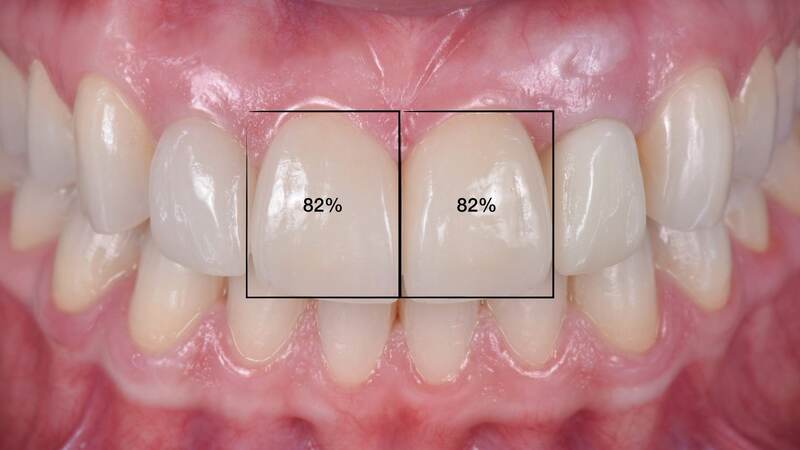 Length/width ratio for ideal aesthetics was planned to be 82%. Pre-treatment panoramic radiograph. 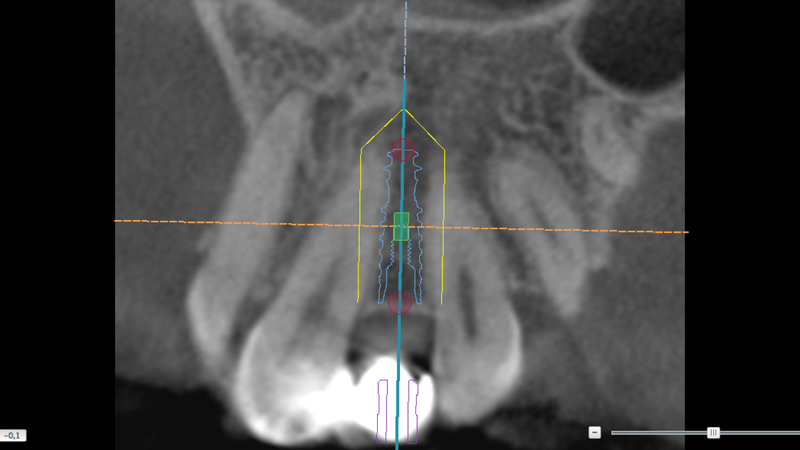 The distal inclination of the root on tooth #21 FDI (9 US), reduced the amount of space available for dental implant placement in position #22 FDI (10 US). Initial cone beam computer tomography (CBCT) scan. 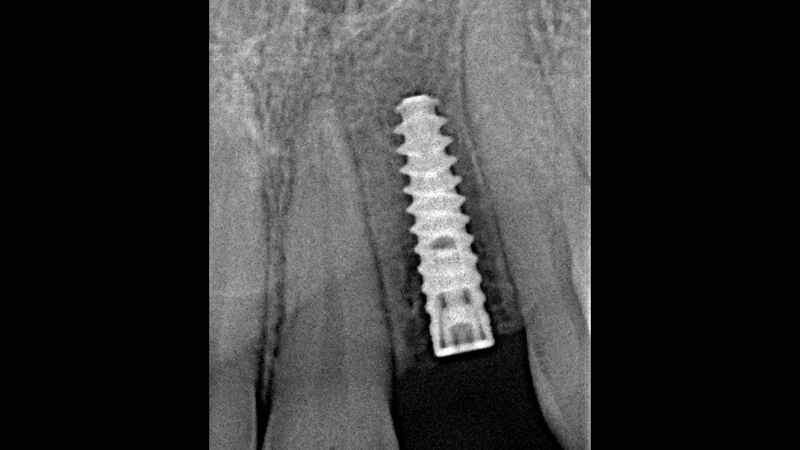 Note there was insufficient mesio-distal space for the placement of a dental implant, ideal space being 1.5 mm minimum between each adjacent tooth. 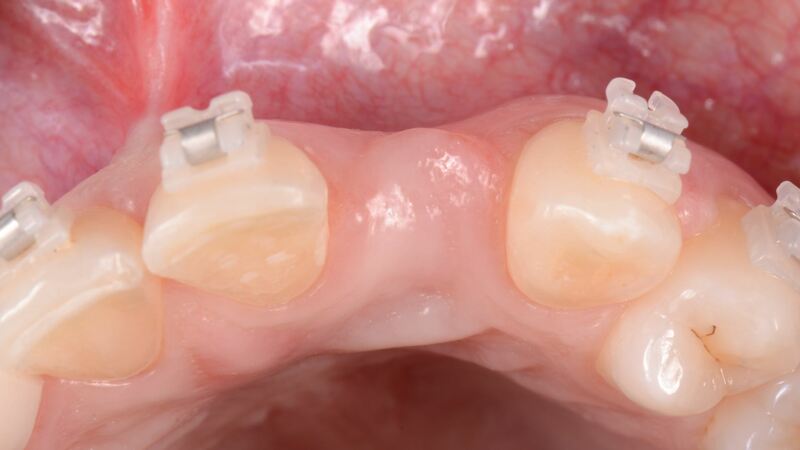 Fixed orthodontic appliances were installed in order to correct that patient's occlusion, as well as create space for a dental implant in position of tooth #22 FDI (10 US). 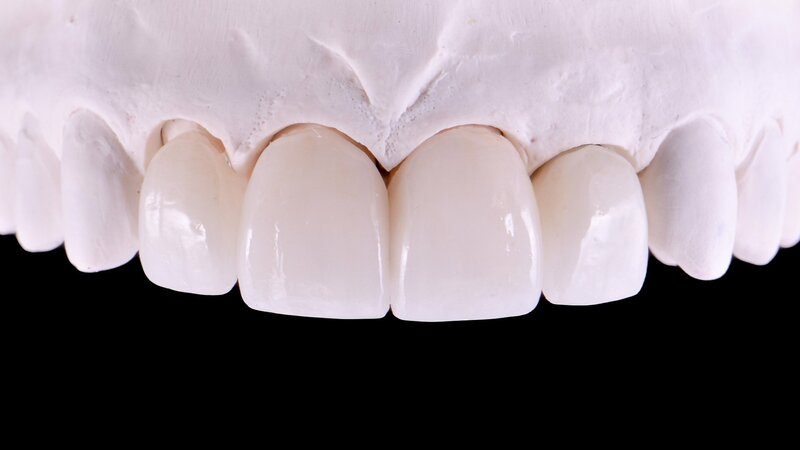 A provisional restoration simulating ideal tooth dimensions was used at the site in order to guide the orthodontic movements. Intraoral frontal view after 12 months of orthodontic treatment. 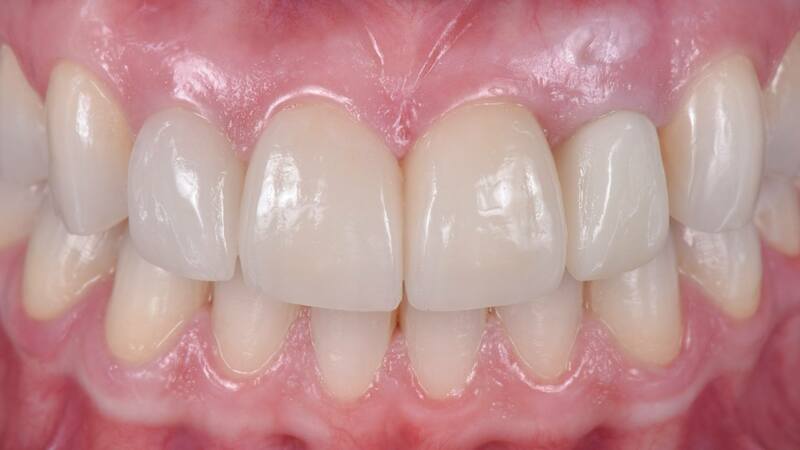 The patient's malocclusion had largely been corrected and the anterior region harmonized. Intraoral frontal view after 12 months of orthodontic treatment. 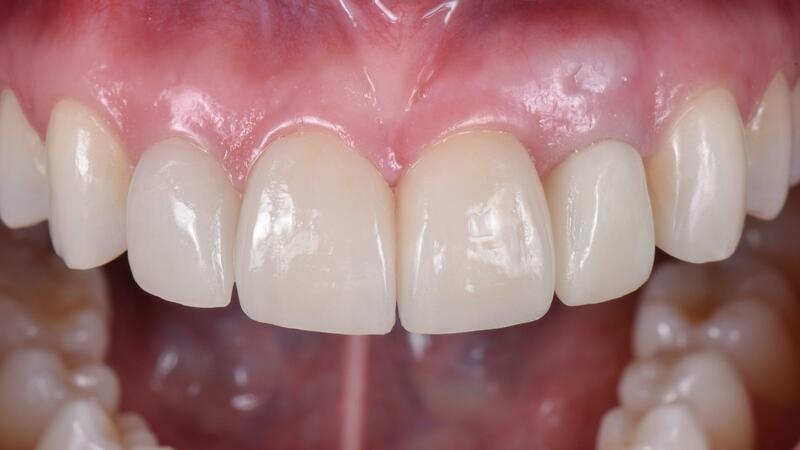 Sufficient mesio-distal space was available for the installation of a dental implant. 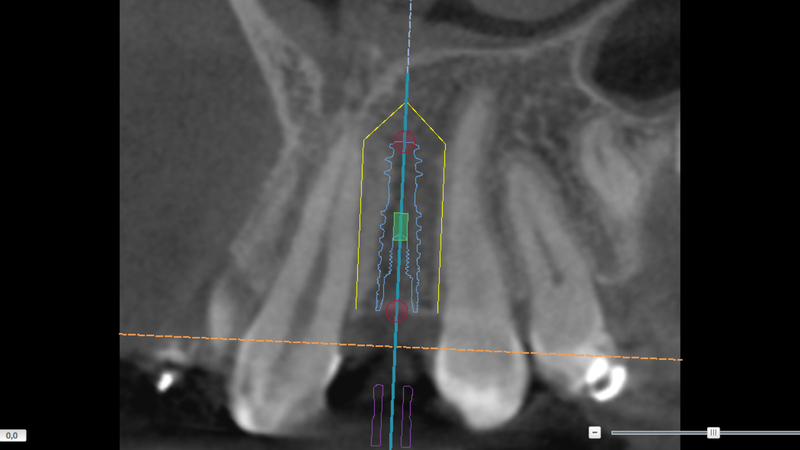 CBCT scan after 12 months of orthodontic therapy. 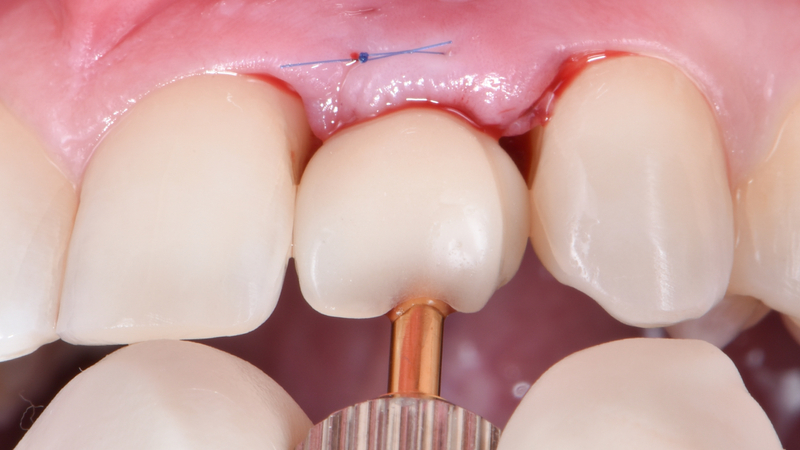 Note sufficient mesio-distal space was available for the placement of the dental implant without compromising the adjacent teeth (around 1,5 mm between the implant surface and the adjacent teeth). CBCT scan sections. 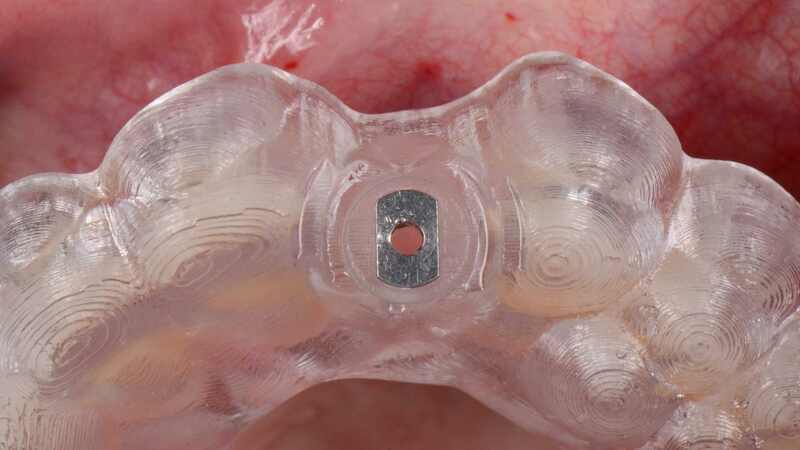 Note a security area of 1.5 mm was available all around the implant except on it's buccal aspect. Occlusal view of position 22 FDI (10 US). 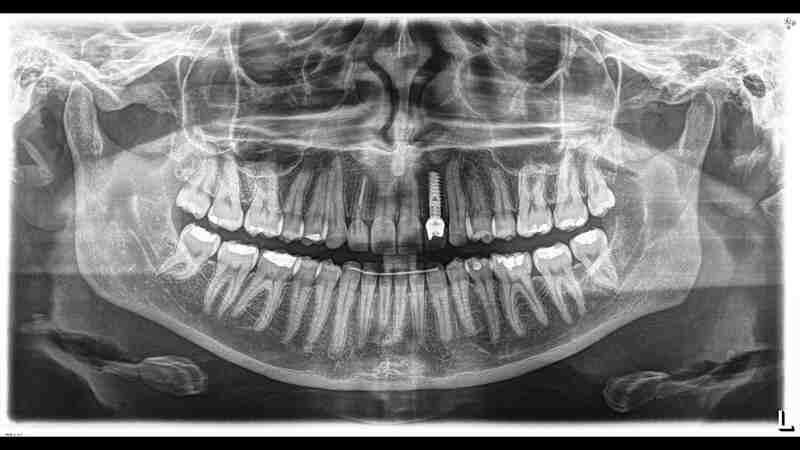 After a phase of orthodontic treatment, sufficient mesio-distal space was available for the placement of a dental implant. The bucco-palatal dimension, however, was still deficient. 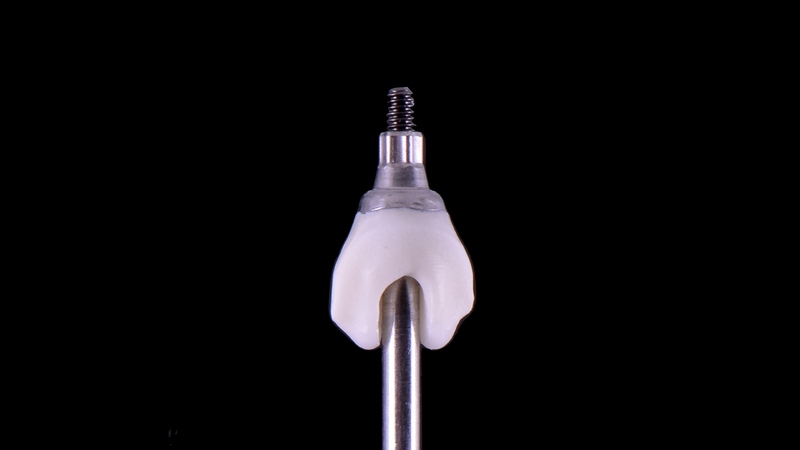 A NobelGuide® pilot drill guide was used for the initial implant drilling. This allows for a more precise 3-dimensional position. Flap elevation. Note the compromised bucco-palatal dimension at the site. Finalized osteotomy. 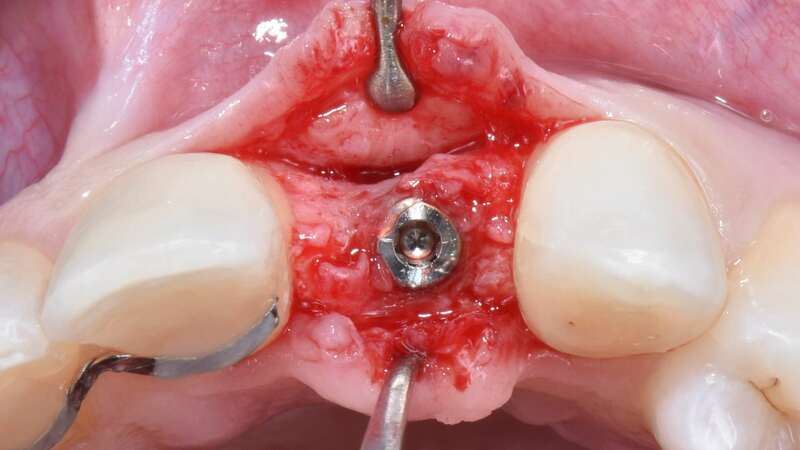 This was performed around 2 mm palatal to the buccal wall, in order to have sufficient bone on the buccal aspect of the implant and avoid esthetic complications due to recession. 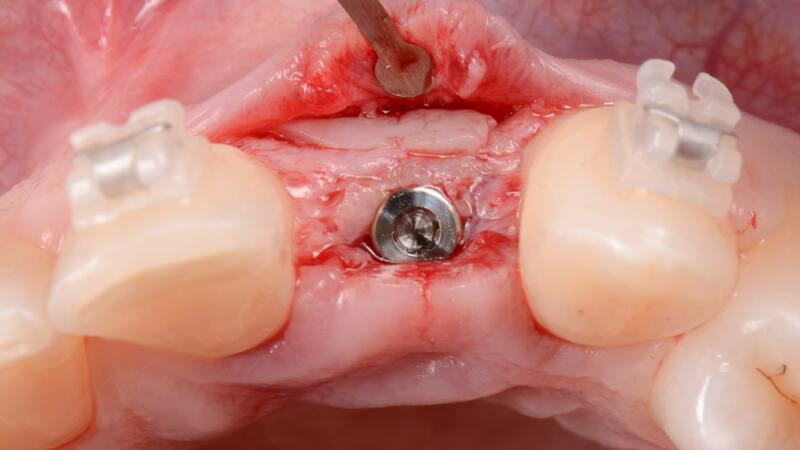 Placement of a narrow diameter NobelActive® implant. 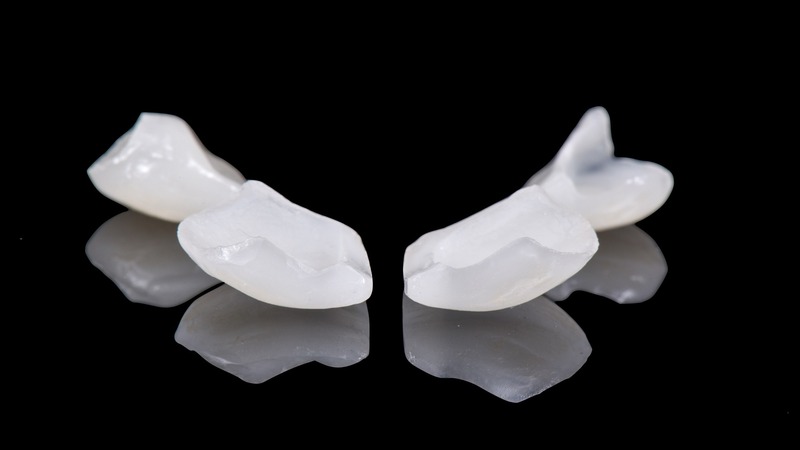 This allows for sufficient bone volume around the implant, reducing the possibility of bone and soft tissue recession and esthetic complications. Dental implant placed. 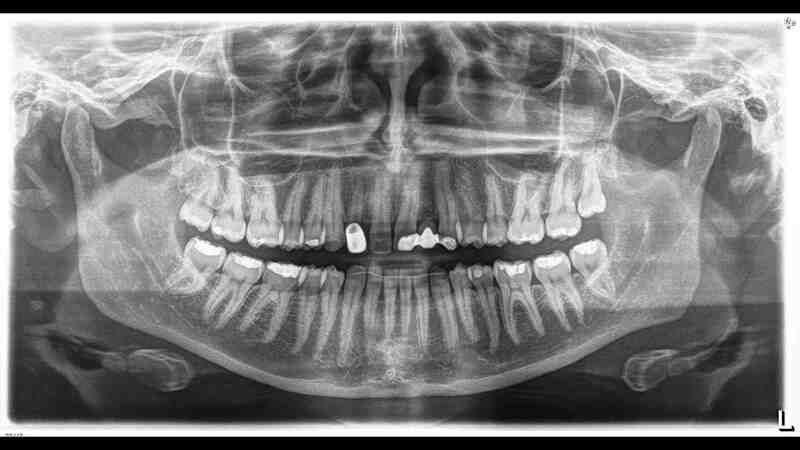 Note the 2 mm of space between the buccal aspect of the implant and the buccal wall of bone. 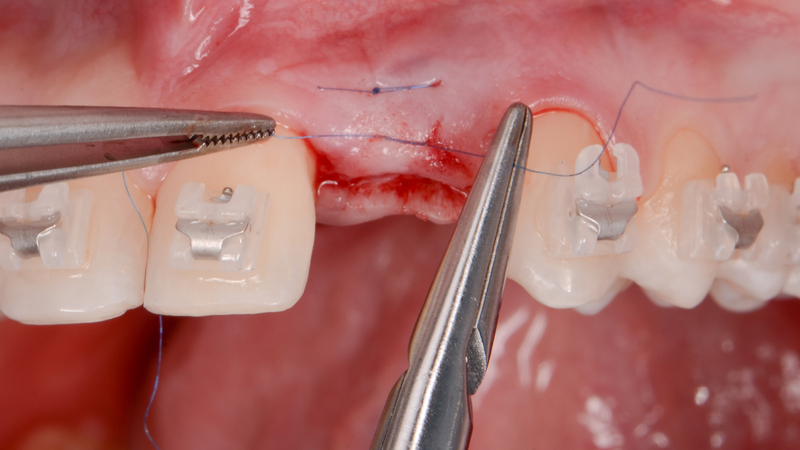 In addition, the implant was placed more than 1.5 mm from the adjacent teeth. 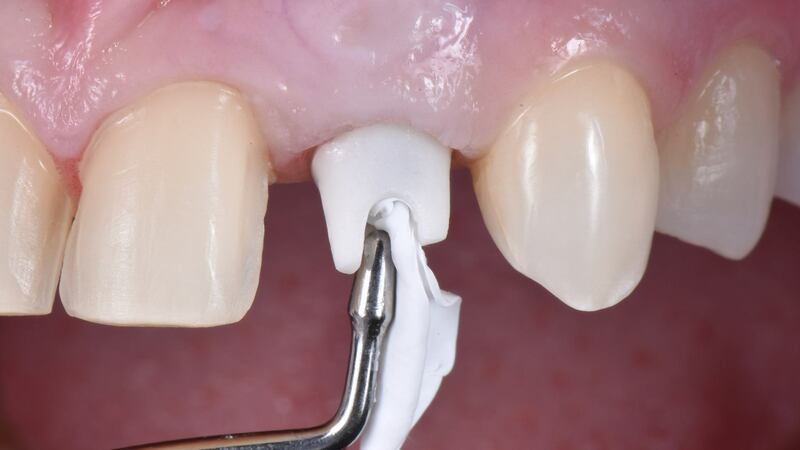 This provides sufficient space for the preservation of interproximal bone and the prevention of esthetic and functional complications due to a deficient papilla. 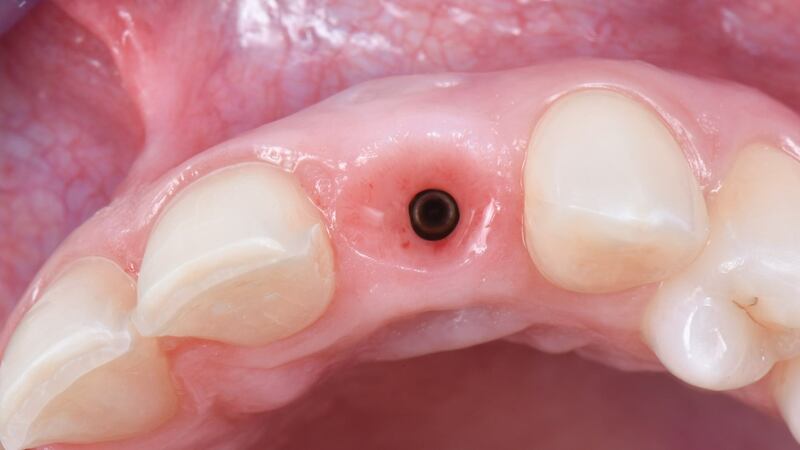 The implant treatment was planned in two stages: One stage of submerged healing followed by a stage of non-submerged healing with a healing abutment. 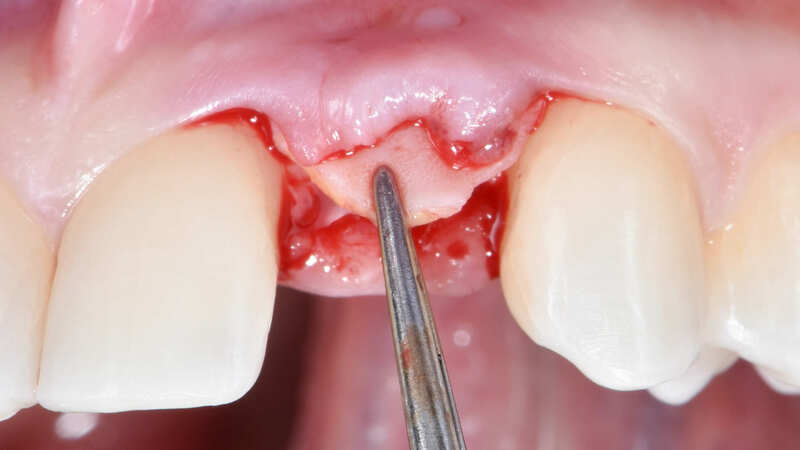 A connective tissue graft was planned to augment the amount of buccal soft tissue volumen and avoid future esthetic complications due to soft tissue recession. 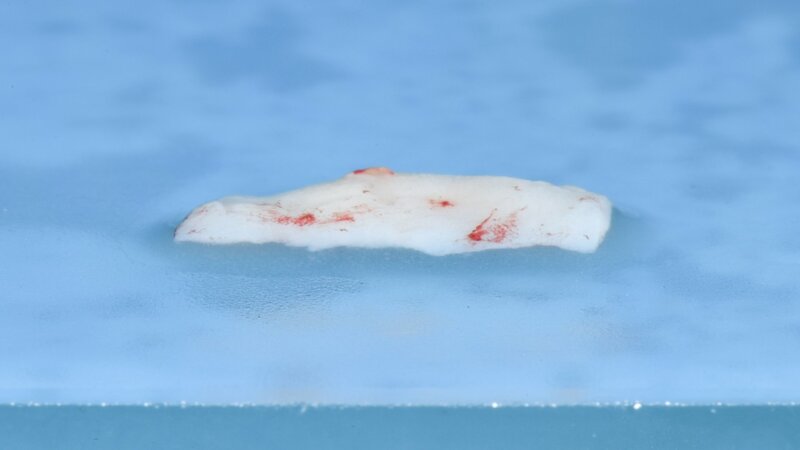 The connective tissue graft was positioned bucally, under the full-thickness flap. 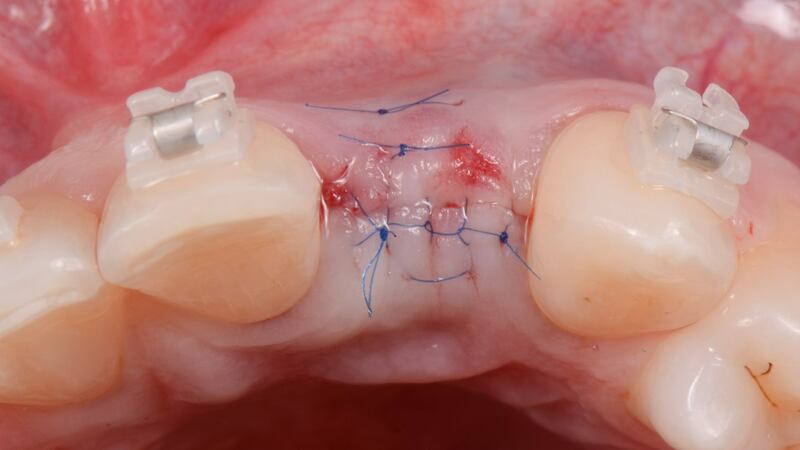 Flap closure by means of single sutures. Periapical radiograph on the day of surgery. 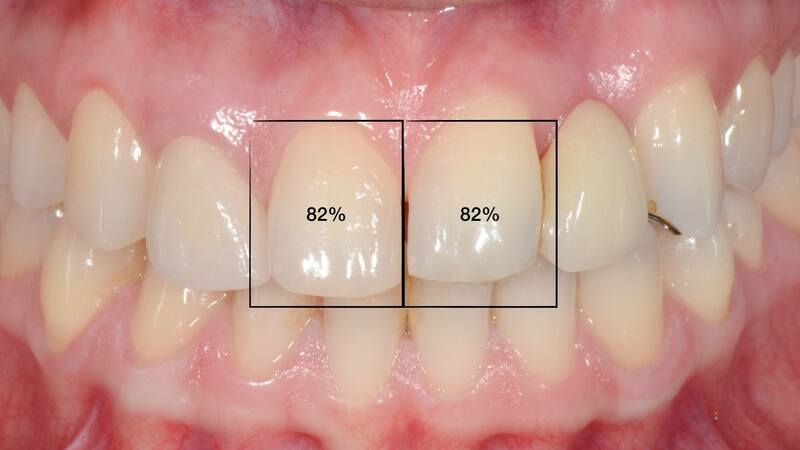 Note the distance between the NobelActive® dental implant and the adjacent teeth (more than 1.5 mm). Occlusal view after 3 months of healing. Note the soft tissues have healed uneventufuly. Flap elevation at second stage surgery. 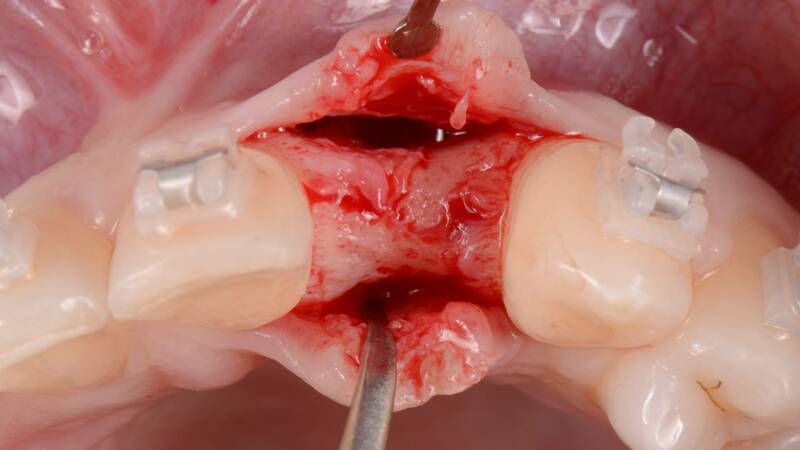 Placement of the connective tissue graft below the full-thickness flap. 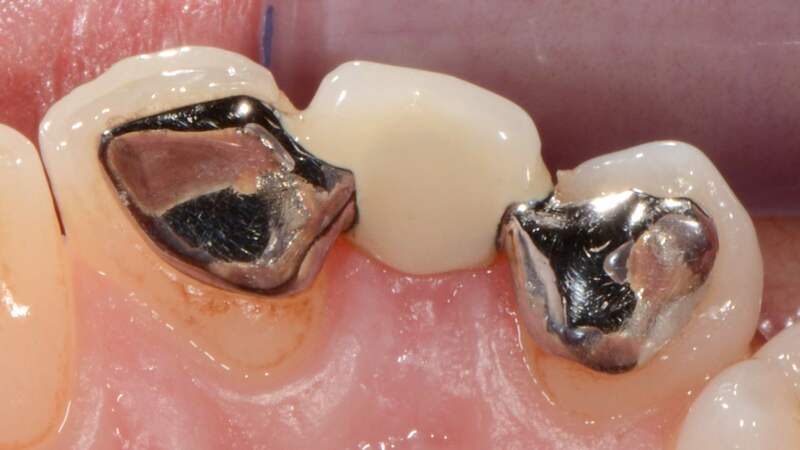 Placement of the long-term provisional restoration. Planned change of dimensions of the upper anterior teeth. The central incisors were to be widened and the lateral incisors to be narrowed. 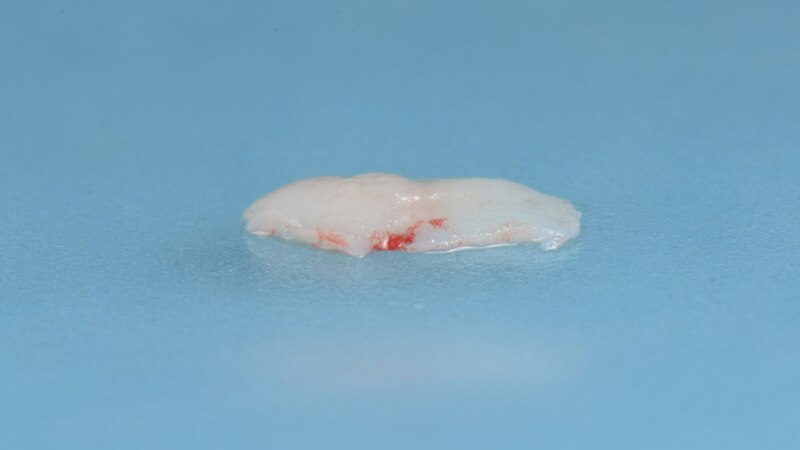 Periimplant soft tissue on the day of the final impressions. Final lithium disilicate veneers and implant crowns. 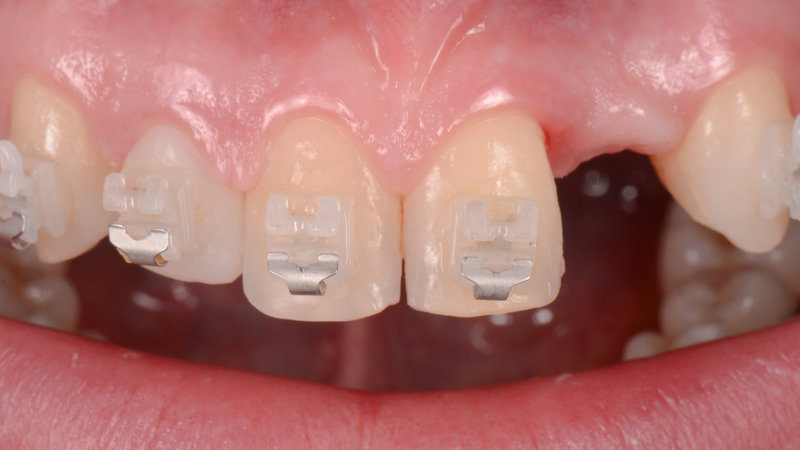 Lithium disilicate veneers and final implant crown on the cast model. 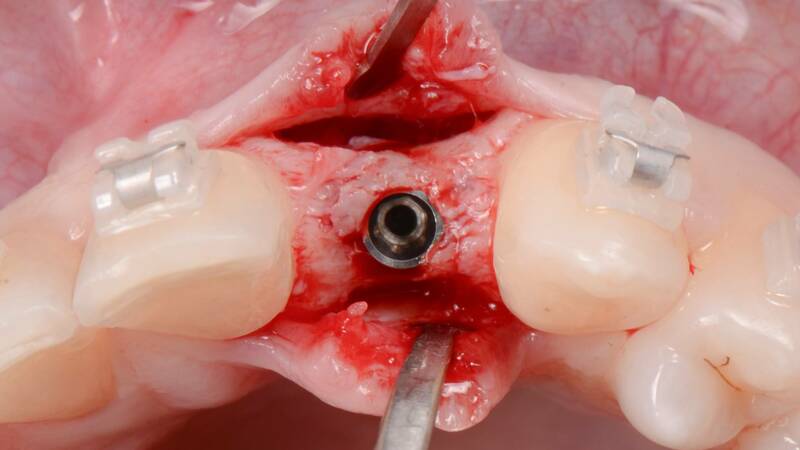 The zirconia screw-retained abutment was placed to restore the implant. 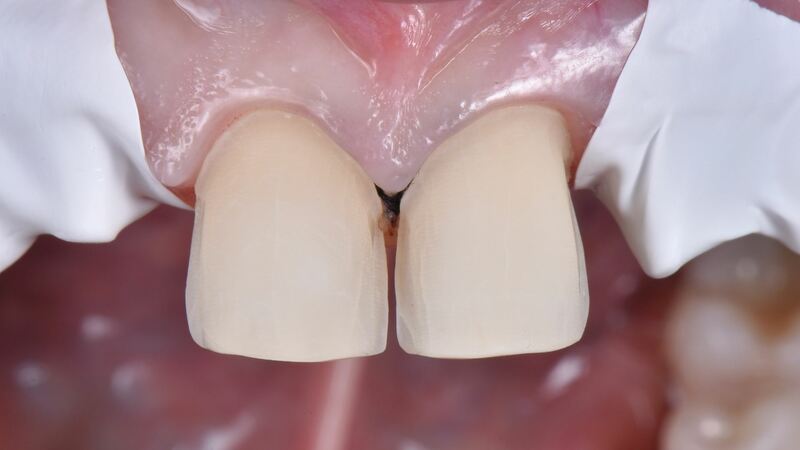 Teeth #11 and 21 FDI (8 and 9 US) prepared for laminate veneers. 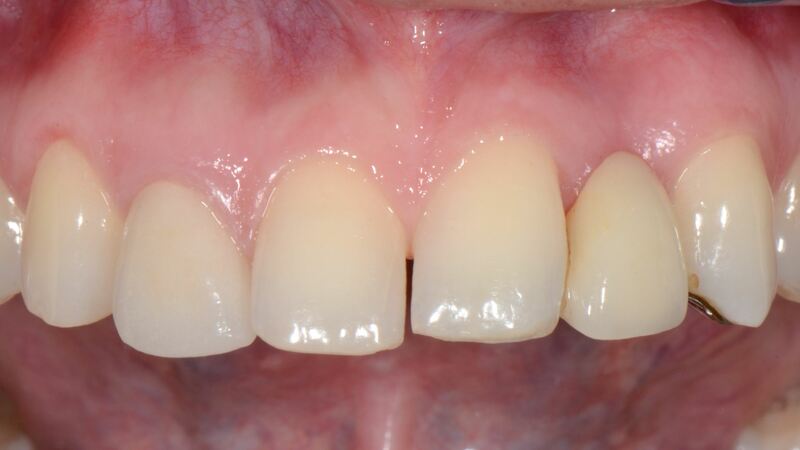 Intraoral frontal post-treatment view after placement of the final prostheses. Intraoral frontal post-treatment view. Note the harmonized pink and white esthetics. 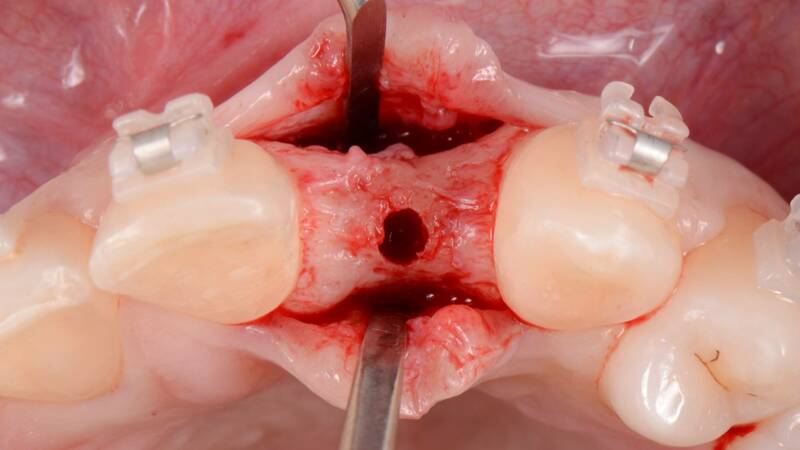 Intraoral frontal view of crown in position of tooth #22 FDI (10 US). Note the harmonized pink and white esthetics. Intraoral frontal post-treatment view. 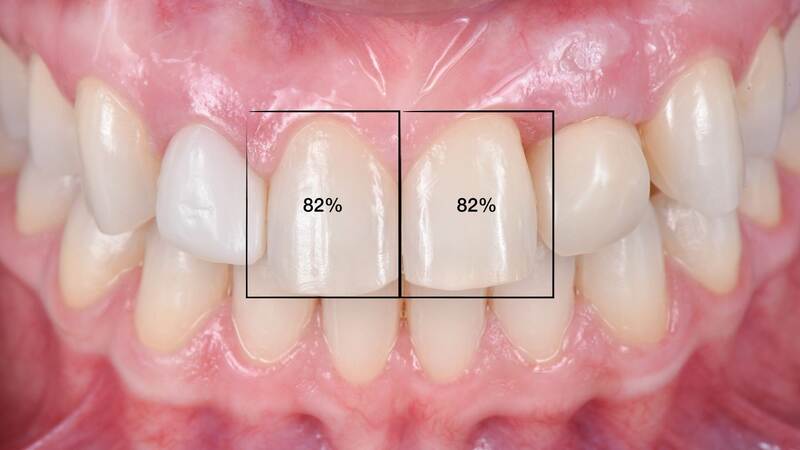 Note the length / width proportion of teeth #11 and 21 FDI (8 and 9 US) have been corrected, harmonizing overall esthetics. Jivraj SA1, Corrado P, Chee WW. 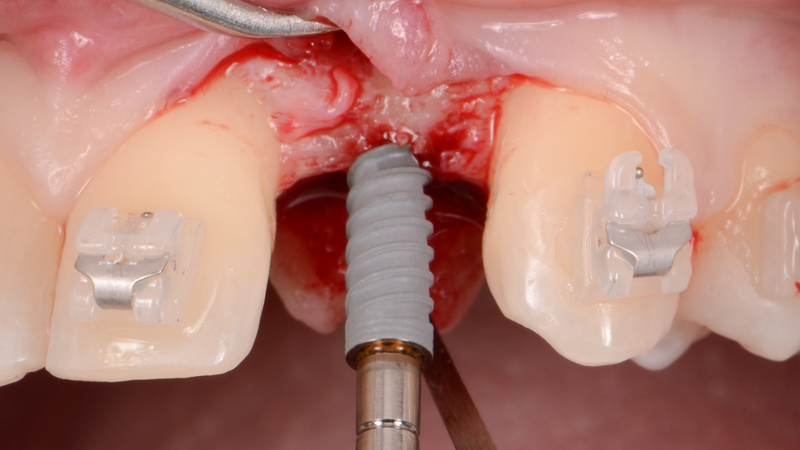 An interdisciplinary approach to treatment planning in implant dentistry. J Calif Dent Assoc. 2005 Apr;33(4):293-300. 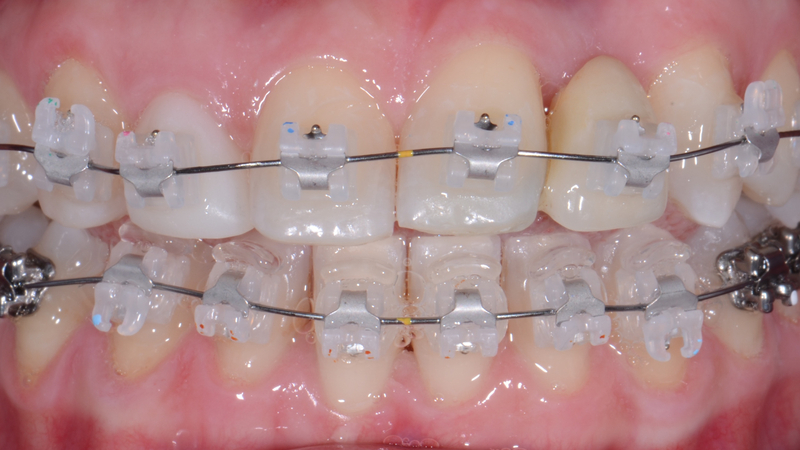 Acharya V, Victor D. Orthodontic management of patients undergoing prosthetic rehabilitation. J Calif Dent Assoc. 2015 Apr;43(4):185-91.